I’ve made a few posts about my martial arts training, which starts to cover the “tough” part of this blog. What about the cookie? Cooking, baking, and the pursuit of wonderful food have always been a part of my life. I grew up in the wilds of Westchester county, NY, following my grandmother over the river and through the woods in hot pursuit of chanterelles, morels, and oyster mushrooms. I learned to bake challah before I could write in script. My family views cooking as a competitive, full-contact sport—one where everyone wins. Family get-togethers mean family meals, and so food has taken on an extra dimension of emotion for me. When I’m stressed, I bake bread. When I want to celebrate, I create elaborate cakes and cupcakes. It’s no coincidence that my second date with the Husband Elect was disguised as a cooking lesson; he took me out for sushi for our first date and refused to let me pay, so I returned the favor by cooking him dinner and teaching him some of my favorite dishes. Food can be nourishing, comforting, healing, and an expression of love. When I sat down to think about the first recipe I wanted to share here, I knew it had to be something simple, yet significant. I couldn’t think of any better way to kick off the food content of this blog than the first recipe I ever memorized or adapted: Maida Heatter’s All American Brownies. This may not be the most intuitive choice for a health and fitness blog, but I believe that there is absolutely room in a healthy lifestyle for delicious, decadent brownies. When I was 7 or so, I was obsessed with Heatter’s Book of Great Chocolate Desserts. My parents encouraged my culinary experimentation, and so my mother’s copy of Desserts was festooned with tiny sticky fingerprints. Other girls pretended to be Punkie Brewster or Jem; I would tie an apron around my waist and carefully star recipes in pencil. (Sometimes I was Baker Jem, a pink-haired glam-rock chef who made cookies and cakes shaped like stars and music notes.) But no matter how many recipes my mom and I made, I kept coming back to the All-American Brownies. Now, I like soft, gooey, fudgy brownies. If you prefer yours on the cakier side, add an extra 1/4 cup of flour and bake for another 5-8 minutes. Try not to drool on your keyboard! Place oven rack 1/3 up from the bottom; pre-heat oven to 350 degrees F.
Place the butter and cocoa in a heavy saucepan over low heat. Stir occasionally, until the mixture is completely melted and smooth. Set aside to cool for about 3 minutes. Stir in sugar and vanilla. Add eggs one at a time, stirring until smooth after each addition. Add flour, salt, and cinnamon, mixing until smooth. Pour batter into pan and use a spatula to smooth the surface and coax batter into the corners of the pan. Bake for 18-20 minutes, until a toothpick inserted into the cake’s center comes out barely clean. Don’t worry if it’s a bit sticky– the brownies will continue to bake a little out of the oven. After removing the pan from oven, allow it to cool to room temperature. (I sometimes have trouble with this step, preferring to excavate the warm brownies if I don’t need them to look super-neat.) Then you can use the edges of the foil to lift the brownies right out of the pan, or you can place a rack or plate on top, invert the pan, lift it off, and remove the foil. Then use another rack or plate to flip the brownies right-side up. Place brownie sheet on a cutting board and cut into 16 even pieces with a sharp knife. If the brownies aren’t cutting easily, chill in the fridge. Wrap or cover any leftover brownies so that they don’t dry out. They can be frozen, or in theory should keep for a week in the fridge, but I’ve never had them last long enough to test that theory. That picture made my eyes bulge. Why don’t my brownies turn out like that? Perhaps because I’m the evil daughter who wrote in mom’s cookbooks in ink. 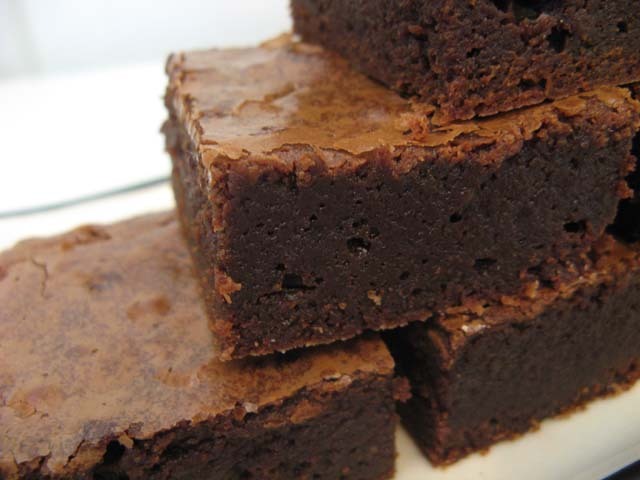 Brownies are like the best dessert ever! These look seriously good! Thanks so much for sharing. They look good, a bit of chocolatey loveliness!